Restoring your cat’s ability to fight infection caused by FeLV and FIV. 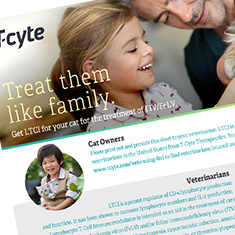 LTCI is the first USDA-approved treatment aid for cats infected with feline leukemia (FeLV) and/or feline immunodeficiency virus (FIV). I've read or have been told FeLV and FIV are not treatable. Is this accurate? LTCI is immunotherapeutic as an aid in the treatment of feline leukemia virus (FeLV) and feline immunodeficiency virus (FIV) infections. As with any new product on the market, it will take time for the new product information to be distributed to animal health organizations and pet owners and updated in literature and websites. LTCI has passed a formal scientific, clinical safety study in which no significant adverse events were reported. Yes. LTCI is a naturally-occurring treatment aid and is not synthetically manufactured. Feel free to contact us at info@tcyte.com. We're here to help! How is LTCI administered and how often? LTCI is administered by a veterinarian with a simple, painless injection under your cat's skin. In the first month of treatment, LTCI is typically administered at days 0, 7 and 14. Subsequently, it can be administered monthly or bi-monthly, or as needed, depending on your cat's response and your veterinarian's advice. Veterinarians will often treat critically ill patients with a more aggressive treatment schedule. When should my cat feel better? Response to treatment will vary, depending on the cat's condition and immune status. Clinical studies show that most cats respond in the first few weeks. Where can I get LTCI? In the United States, LTCI is only available through licensed vets. Contact your clinician to discuss LTCI treatment options or search below for clinics already administering LTCI to its patients. 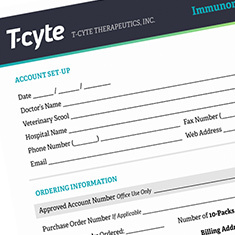 Order requests outside the United States can be directed to order@tcyte.com.